The export of algae oil omega-3s is a contribution that the United States of America can make to the world. “It is not the algae oil for fuel ideas being spun around, it is the 100's of millions of dollars annual world market for algae oil foods and nutraceuticals, something distributors in India should know more about,” says Dr. Scott Doughman, founder of Source-Omega in the US. Bangalore, India, March 31, 2010 --(PR.com)-- The Source-Omega company announced today their products are available to the world with an eye on India. The company is providing their US patent pending “metabolic ratio” of DHA and EPA omega-3 products from algae oil. There are at least two companies exporting algae oil from the US. 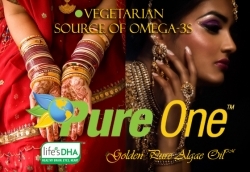 One is Source-Omega™, the makers of Pure One™ supplements containing Golden Pure Algae Oil™. “We bring a heart to algae oil. We want to go where there is the greatest need. India is an important partner country where half of its adult population has high cholesterol and a third have high triglycerides. Source-Omega’s products and co-therapies are vegetarian replacements for fish oil, capsule for capsule,” says Dr Doughman, Ph.D., Biochemist and Lipidologist. The company points out the role Source-Omega plays in serving DHA-rich algae oil to the world is easy to remember. The company’s position is that “D” is for Diabetes, “H” is for Heart Disease and “A” is for Alzheimer’s, DHA. They provide ample certificates and references for clinicians and scientists requesting more information.